We arrived safely after an 11 hour flight. The warmth of the tropical midday sun matched by the warmth of the welcome by both local officials and the organisers of the event. 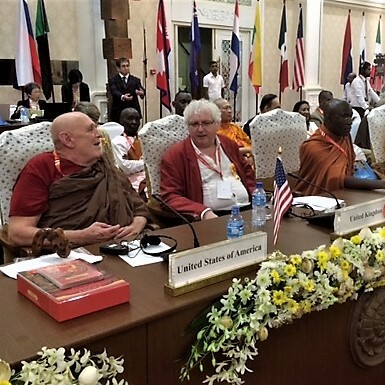 Right is a picture of Lama Jampa with the President and Vice President of the World Buddhist Summit. 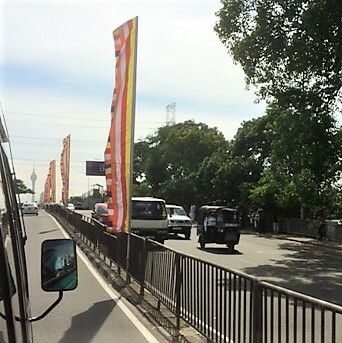 We were escorted by police motorcycles, through the heavy afternoon traffic, down avenues decorated with Buddhist flags in honour of the Summit. Today saw the opening of the 7th of these international events, with welcoming addresses from: H.E. Khamba Lama from Mongolia, President of the Summit; Hon. Ranil Wickremesinghe, Prime Minister of Sri Lanka; and H.E. Maithri Sirisena, the President of Sri Lanka. Right are myself and Lama Jampa’s wife, Dechen Dolma, following the procession into the Summit. The afternoon session consisted of the keynote speech by Ven. Dr Shinkai Kori, in which he reminded us of the history and purpose of the summit: to bring together Buddhists of all traditions for the promotion of world peace and how this was more important now than ever. Sri Lanka has really taken this Summit to its heart and has even issued commemorative stamps in recognition of the event – copies of which were presented to the Buddhist Representatives. Left is Lama Jampa accepting a commemorative book from the Prime Minister of Sri Lanka. 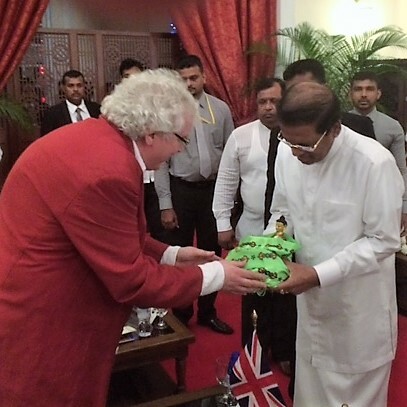 This evening we attended a reception with the President of Sri Lanka at his official residence. During the course of the reception Lama Jampa had the opportunity to offer His Excellency a Statue of Shakyamuni Buddha, which you can see on the right. The reception finished with refreshments, before we finally returned to the hotel at the end of a long but memorable day. And that’s just day one of the event! 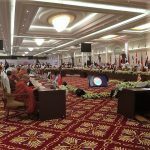 Today saw the end of the two days of round table discussions at Temple Trees, the Prime Minister’s conference hall. 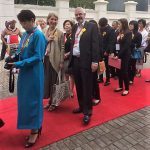 Given there were 47 countries represented and each representative made a short presentation there was little room for discussion but it was interesting to hear from teachers from such different traditions and from such different countries. Particularly inspiring was hearing from representatives from several African countries about the creative ways they are working to open up the dharma on that continent. 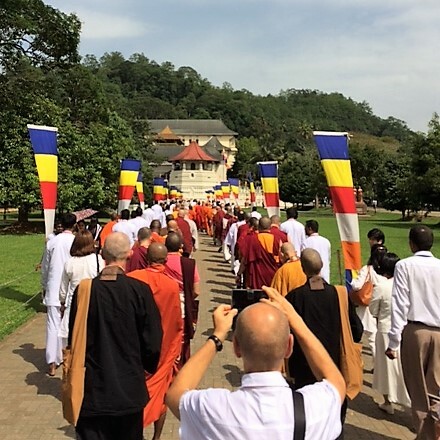 The day ended with a formal announcement that the project to build Nalanda, an international, interdenominational centre for the sturdy of Dharma, is near completion and to celebrate this and mark its formal opening, the 8th World Buddhist Summit will be held next November in Japan. We saw the start of this project when we attended the 6th World Buddhist Summit in 2014 and the ambition and scale of it is hard to convey. Today’s lunch was served at Seema Malaka Temple, situated on Beira Lake. We were met by traditional drummers and dancers and welcomed by the monks of Gangaramaya Temple. 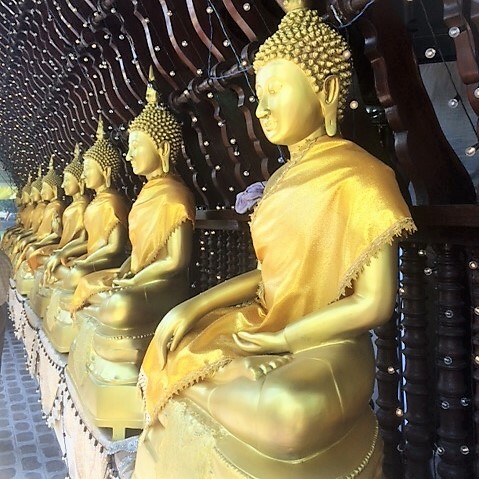 The Temple has many beautiful statues, includes a stupa and Bodhi Tree and sits out in the lake. 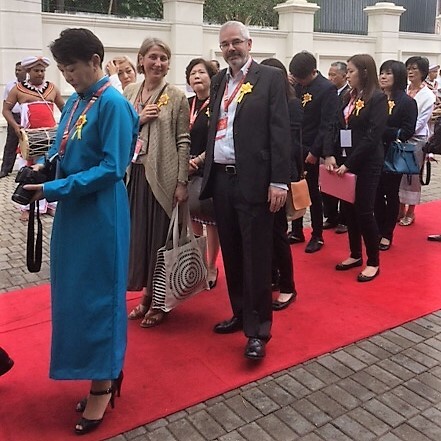 Following the meal all the delegates were blessed by a relic of the Buddha. Somehow, in the general melee, we ended up receiving the blessing twice! 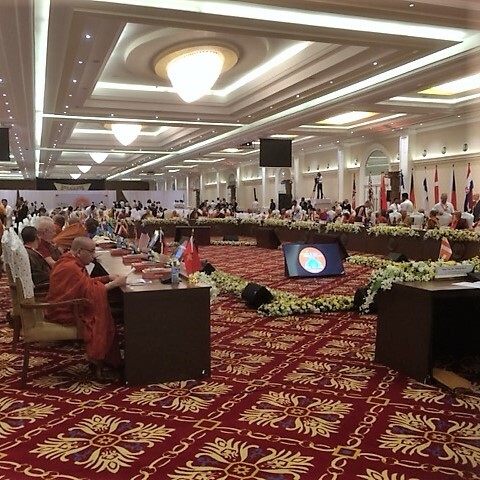 The formal part of the Summit finished this morning, with prayers, offerings and speeches. Following a welcome afternoon off, we were taken to the National Theatre for a specially commissioned cultural event. Featuring traditional music and dance, combined with lighting and film, it told the story of Lord Buddha and the coming of Buddhism to Sri Lanka. Unfortunately I didn’t take any pictures and I don’t have the words to do it justice, but it was a wonderful spectacle, preformed with grace, energy and heart. We were told that all the performers had prepared by avoiding meat and animal products and keeping the five precepts. This is our liaison officer Charaka, or rather Captain Charaka Abeyawardena. For when he is not looking after the UK delegation he is a Captain in the Sri Lankan Airforce. 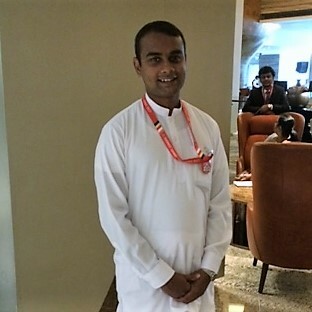 Like all the volunteers, Sri Lankan and Japanese, he has worked tirelessly to make sure we have everything we need and are in the right place at the right time. 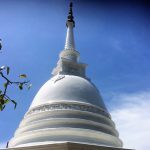 Tomorrow starts at 4am, as we journey to Anuradhapura to begin a two day tour to the ancient heart of Buddhist Sri Lanka. So I think it’s time for bed! It’s is 10.15pm and the end of a very long day which started at 4am and included over 8 hours of travelling! It was nice to see something of Sri Lanka outside of Colombo but it was truly gruelling. While it was hard going for us, my heart really went out to the organisers and volunteers, who worked tirelessly throughout the day. 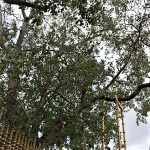 Unfortunately we weren’t able to stop off at many sites, but we did get to visit Sri Maha Bodhiya, Sri Lanka’s oldest tree. Planted in 288BC, it was propagated from the original Bodhi Tree in Bodhgaya and was brought to Sri Lanka by Venerable Sanghmitta Therini, daughter of King Ashoka, who helped introduce Buddhism to Sri Lanka. It is the worlds oldest living tree, planted by humans, with a known planting date. The other site we stopped at was Dhambulla Golden Temple, with its astonishing, enormous Buddha. We were able to catch a glimpse of some of the many wonders of Anuradhapura as we were driven round but this just left a feeling of regret at not having time to visit properly. Another long day, finally arriving back in Colombo late in the evening. Fortunately our flight tomorrow is after midday, so we have time to rest and organise ourselves for the journey home. Today was very special, as we visited the Temple of the Tooth Relic in Kandy. This was opened especially for the World Buddhist Summit. The sanctuary, where the Relic is kept, is only opened a few times a year. Charaka told us that, though he had visited the Temple on 15 occasions, he had never seen the Relic before. Indeed, his parents came a few years ago and queued for a day and a half to see it so we were truly privileged. On the left you can see us processing into the temple. We also visited the Museum of World Buddhism which is within the Temple complex. This contains many wonderful artefacts but it felt quite sad because it was a reminder of all the countries where Buddhism once flourished but is either no longer present or is greatly diminished. To the right you can see Lama Jampa next to a statue of Amoghavajra, who took the Vajrayana teachings from Sri Lanka to China, in the 8th century. 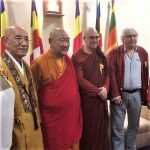 We finished the visit with refreshments and final messages of good will from: Thilanga Sumathipala, the Deputy Speaker of parliament; the custodian of the Temple of the Tooth; and Khamba Lama, President of WBS. 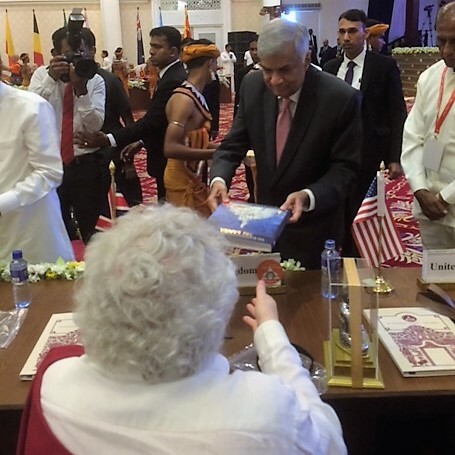 As this is my final blog from Sri Lanka, I would like to end with a big thank you to the organisers of the summit – to Charaka and all those who looked after us. It has been a truly memorable experience! 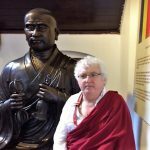 For more information about our main teacher, Lama Jampa Thaye, check this page out. 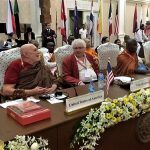 For more information about the World Buddhist Summit check this website out.